Today, I made my coffee, checked my emails, and then talked to someone on the phone while driving. When I arrived at my client’s office, I answered two texts before our meeting. On my drive back, I made another call to another client. Once back at my office, I answered six instant messages and two texts. Whew. That was my morning, how was yours? If you’re a business owner, it might have looked something like mine, and you may have also handled a call from a sick employee or fired someone. These are all important tasks that business owners need to do, but this is not the type of work that will make me, or you, an industry leader. 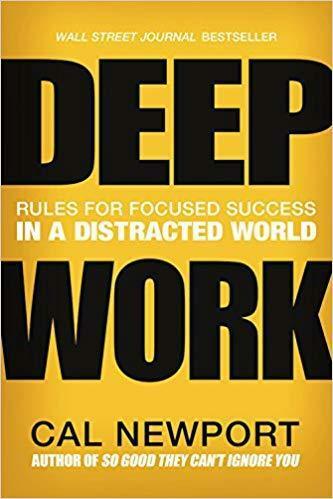 What I learned from reading Cal Newport’s book, “Deep Work: Rules for Focused Success in a Distracted World,” is that to be a leader, I need un-distracted time to focus. I’ve known for a long time that if I want to be successful, I can’t just work in my business—I have to work on my business. “The E Myth” by Michael E. Gerber taught that idea to me first. However, Newport’s book made me further realize the importance of taking time out to think, innovate, reflect and learn. As a business owner, deep work is the time when you form a new business strategy or product development strategy or figure out the best ways to improve service or quality. Or it could be time to develop intellectual property, write a book or otherwise establish yourself as an industry leader. I’ll be honest with you, when I first read the book, I became agitated. I thought, “Well, it’d be easy for you Mister Professor! You can just take a sabbatical and do deep work. I can’t just leave my business for a semester.” However, Newport anticipated my resistance and also provided some strategies for carving out time for deep work. For example, for one weekend a month, you could block out time to go to a cabin or hotel to focus on your deep work. Alternatively, you could block out time for deep work on your calendar several days a week. Even taking two or three hours to go to a place where you cannot be found or distracted can create an environment for deep work. The bottom line is that doing deep work is vital for any business owner who wants to be the best. Artificial intelligence, machine learning, and robots are already doing shallow work. The people who will excel, lead and be more competitive will be the ones who can do the deep work and elevate their value by improving their skills and innovating new ideas. How do you plan on making time to do “deep work?” Leave a comment below! I love this! Yeah, all the new strategies and technology has me doing important shallow work. I feel I would like to block out 1/2 day each week for deep work! I’m doing it! I also have been making sure I take a full day off, without phone or distractions to not do work at all. Don’t get it into your head Alice to take yourself into those Mountains where you can’t be found to focus, I don’t want you getting lost!!. — Barry.